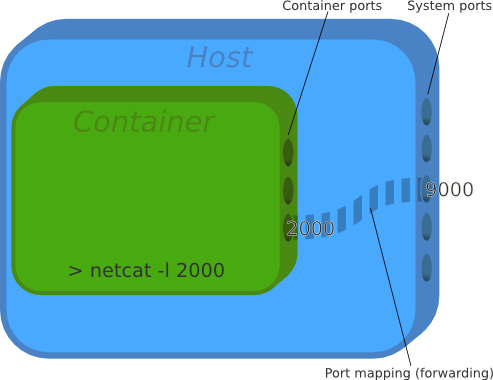 If you are mingling with docker and containers on servers, you'll at some point want to have two containers communicate with each other. I will completely omit the first way since it's a brainfuck both conceptually and technically (yes, I am aware of Dind). Been there, done that, and it wasn't pretty. The second solution is about sharing folders between host and container or between containers by using docker's --volume flag. This is practical when you want to share files (source code, configuration files etc.) on a local machine. If you want containers on different hosts to communicate however this won't suffice. The two remaining solutions is the meat I will try to break down for you (and minimize your flatulence from the learning curve). I did my research and I will do my best to convey what I came down to. But enough talk, let's start! I will use netcat to show how all these things work. To remind you, netcat is a Unix tool similar to cat but supposed to work on the network (thus the name net-cat). Practically it's used when you have to copy/paste from host to an other host, chat with someone fast, or just test communication between two hosts like we do here. The flag -n is a deprecated flag for networking. In practice without the -n flag, everything will work as before but for some weird reason there will be an initial lag for the first netcat message. So if you don't use it, just wait a bit longer. So what are those so called links? Nothing special actually. It's just some variables passed from one container to an other. In most cases these variables will hold things like IPs, ports, etc. Thus it's just a step of simplifying things for us - in the end we will probably just use these variables to connect as before. You will successfully ping the other container. $MYSERVER_PORT_8000_TCP_ADDR is simply a variable set by docker on the newly created container, the one with the --link flag. You can see all variables with the command env. Depending on what flags you passed to the container, you will see appropriate things. In practice, if you don't use the -p flag, you won't see anything interesting (useful). That's pretty much all to linking! By using these variables you can get the IPs and ports of other containers on the same host. That's an important annotation. You can only link to a container running on the same hosts. 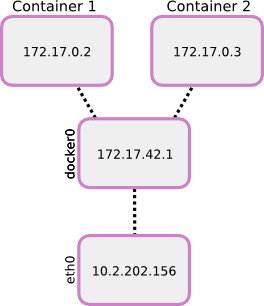 For communicating to containers on distant hosts you'll need to use port mapping as explained earlier.